And Georgia May Jagger gets typecast again. Marchesa designers Georgina Chapman and Keren Craig went all out for their brand’s 10th anniversary, showing in an opulent venue in London instead of New York, and bringing out Anna Wintour earlier than we usually see her in London. Despite their move across the pond (a one time thing, they say), the designers channelled an event that took place in New York: Woodstock. Yes, the fanciest of fancy dress labels (at least in the U.S.) found inspiration in festival style. 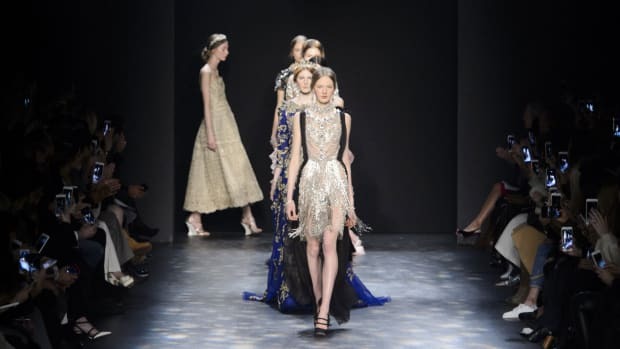 That manifested in dresses that were just as luxurious and lacey as we’d expect from Marchesa, but in looser silhouettes, with more billowing sleeves and a lot more flowers and tiered ruffles. Consummate cool girl/rock royalty Georgia May Jagger was typecast for the second time this fashion month as she opened the show. Flowers were the big takeaway: Large 3-D ones trickled down a number of lace and chiffon dress. The effect was very Dolce & Gabbana, and made me feel like perhaps that sort of thing should be left to them. There was also a section of yellow and cobalt hand-painted birds on shift dresses and tea-length skirts. Chapman and Craig definitely took risks this season and it will be interesting to see whether their celebrity fans will also take them on the red carpet by wearing some of the collection’s more worked-on pieces. See the full collection below.